Note: This update is available for Windows 10 Version 1809 different architectures (x64, x86, and Server 2019). If download, ensure the correct file is chosen. If malware(an infection) is found, Windows Defender Offline will provide the ability to remove the malware/infection. Current Branch – Consumers will will regularly receive all new features, security updates and other fixes to the operating system. No choice will be available as to which updates they wish to receive or don’t receive. All updates will be deployed via Windows Updates but not on any given day (i.e. no Patch Tuesday). This method is also applicable to all Windows 10 Mobile devices personal and business. 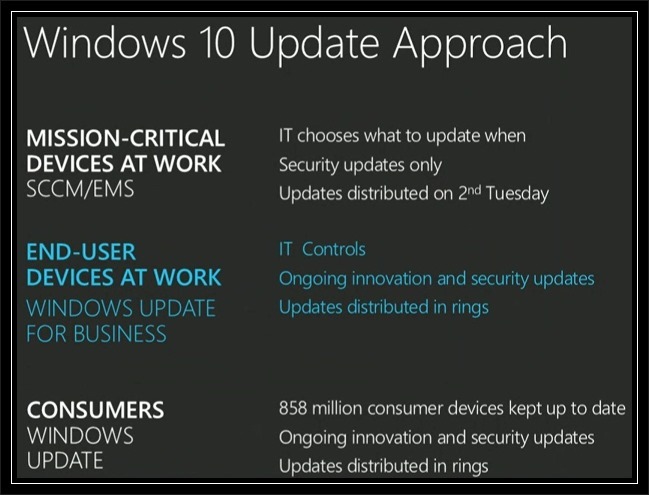 Windows Update for Business – End users not running mission critical devices will be able to receive new features, security updates, and other fixes at a measured pace (Distribution Rings, Maintenance Windows, Peer to Peer Delivery, and Integration with existing System Management tools) for Windows 10 Pro and Windows 10 Enterprise devices. 2. 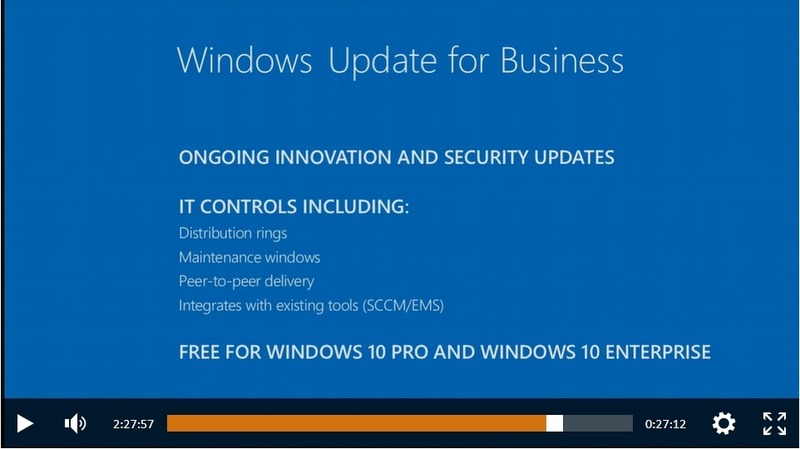 Windows Updates in Windows 10 was presented during Microsoft Ignite – Microsoft’s show for IT professionals. The presenter is Terry Myerson, Executive Vice President of Operating Systems, Microsoft Corporation. The Microsoft blog article provides sound advice on ensuring your account takes advantage of available security options. A summary of those and other recommendations are shown below.